Labour leader Joseph Muscat has made a tangible effort to close one of the darkest chapters in Maltese political history by holding a short private meeting with two of the brothers of slain Nationalist activist Raymond Caruana. 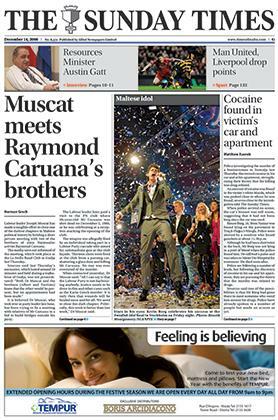 It is believed Dr Muscat, who took over as party leader last June, has been trying to fix a meeting with relatives of Mr Caruana in a bid to build bridges outside his party. 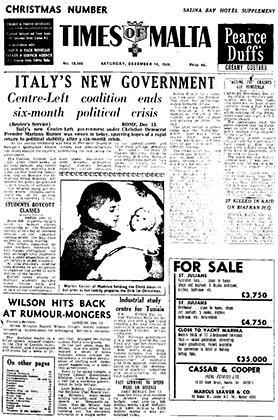 The Labour leader later paid a visit to the PN club where 26-year-old Mr Caruana was shot dead on December 5, 1986, as he was celebrating at a reception marking the opening of the club. The weapon was allegedly fired by an individual taking part in a Labour Party carcade who aimed his submachine gun at the club façade. Armed Forces Commander Brigadier Maurice Calleja failed to show up for the Republic Day parade in Valletta yesterday, adding fuel to reports that he is set to quit. “His family loyalties and official duties are in direct conflict” – his daughter Clarissa Cachia was earlier this month arraigned in court on cocaine possession and trafficking charges. Although the brigadier’s personal integrity is not in question, the situation is considered untenable. Along with the Police Commissioner, Brigadier Calleja is jointly responsible for the battle against drug-smuggling and trafficking. However, Brig. Calleja had denied he was under pressure to resign and said he would take the salute at yesterday’s parade. 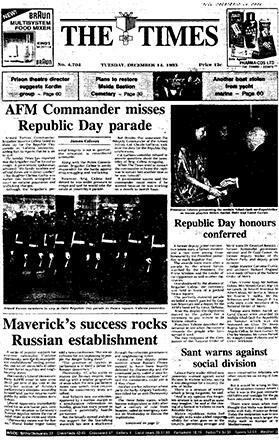 But despite this assurance the deputy Commander of the Armed Forces, Col. Claude Gaffiero, took over the duty for the Republic Day celebrations. Victorine Gauci, the Social Worker of the Malta Welfare Society for the Mentally Handicapped, has just returned to Malta after a two-month period of training in the United Kingdom under the auspices of the National Society for Mentally Handicapped Children. During her stay in the United Kingdom, Miss Gauci visited various residential homes, training centres and schools, took part in discussion groups and worked with social welfare officers on family welfare and case work among the retarded and their families in the Manchester, Liverpool and London areas. She was for a time attached to staff of the Centre for the Educationally Subnormal at Pengwern Hall, near Rhyl in North Wales run by the National Society for Mentally Handicapped Children. After her period of training with the National Society for Mentally Handicapped Children, Miss Gauci was the guest of Dr R.D. Fidler, the Principal Medical Officer for Mental Health of the London Borough of Harrow, who was recently in Malta. It will be recalled that Dr Fidler had offered to help in the training of Maltese personnel working in the field of mental health.